A-Number backup for MS SQL Server program is used for automation creation of database archives which is working under control of MS SQL Server, and for quick restoration of databases from backup copy. Windows servers of 2000 Ã¢â‚¬â€œ 2008 years are supported by this program. The program simultaneously working with all SQL servers which is situated at the local network. 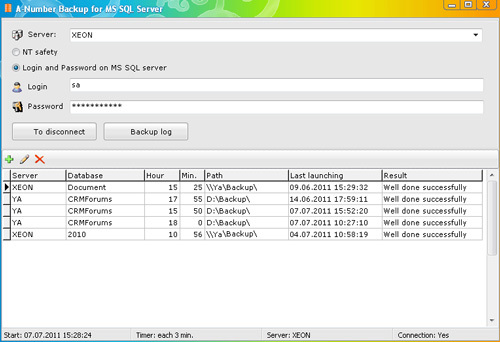 This site does not contain serial number, crack, keygen A-Number backup for MS SQL Server serial number : serial number is the simplest type of crack. A serial number(cdkey,product key,etc) is register the program as you may already know. a crack or keygen may contain harmful software. If you cannot find the exact version you want, just give it a try. for more information read .nfo/.txt/.diz file include in zipped file.